In a small saucepan set over medium heat, whisk together the milk, pumpkin pie spice and pumpkin puree until the milk is steamy and warm. Add the hot coffee to a mug. Pour in the warm pumpkin milk. Top with whipped cream and an additional sprinkle of cinnamon, if desired. Love pumpkin lattes but don't like the price at the coffee shop? Problem solved -- make your own at home! It was years ago that I heard an office-mate excitedly telling another coworker that the Pumpkin Spice Lattes were back at Starbucks. I didn’t know what the fuss was and dismissed the whole thing. Fast forward to this past September. I was in line at Starbucks and saw the Pumpkin Spice Latte advertised. On a whim, I skipped my usual quad venti caramel latte and instead ordered the Pumpkin Spice Latte. It was so good that I immediately IM’d a friend about it when I got home. And when we and another friend met up that weekend, I came with three Pumpkin Spice Lattes. I had to share – they were too good not to. The good news is that you can make a great Pumpkin Spice Latte at home for pennies. Really. Pennies. Start by making a warm, flavored pumpkin milk. That’s just milk, pumpkin puree and spices, all heated and whisked together. Then add that to strong, hot coffee. Top it off with whipped cream and cinnamon and you’re set. One note: These lattes aren’t that sweet (it’s a personal preference) – but if you like yours sweeter, just add a little sugar before topping with whipped cream. 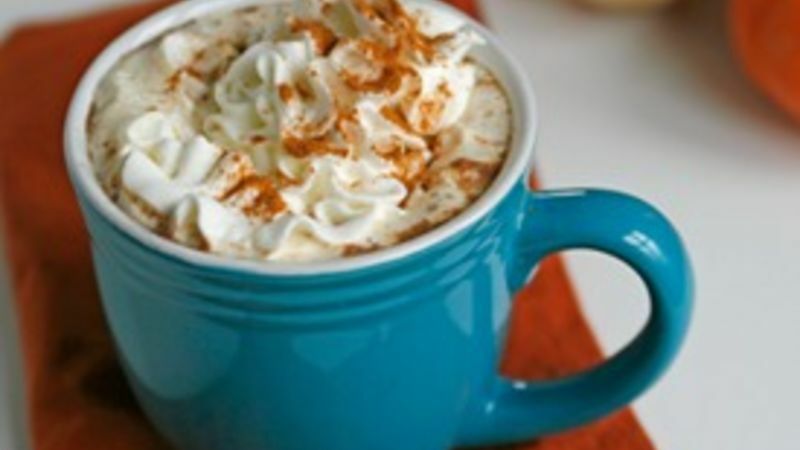 Tell us what hot drinks you like to make at home!